Every system administrator has to deal with plain text files on a daily basis. Knowing how to view certain sections, how to replace words, and how to filter content from those files are skills you need to have handy without having to do a Google search. In this article we will review sed, the well-known stream editor, and share 15 tips to use it in order to accomplish the goals mentioned earlier, and more. As you can see, the -e option allows us to execute a given action (in this case, print lines) for each range. Of course, you can indicate a single line through its corresponding number instead of a range. Sometimes configuration files are loaded with comments. While this is certainly useful, it may be helpful to display only the configuration directives sometimes if you want to view them all at a glance. The caret sign followed by the number sign (^#) indicates the beginning of a line, whereas ^$ represents blank lines. The vertical bars indicate boolean operations, whereas the backward slash is used to escape the vertical bars. In this particular case, the Apache configuration file has lines with #’s not at the beginning of some lines, so *# is used to remove those as well. Another use of sed consists in printing the lines from a file that match a given regular expression. For example, we may be interested in viewing the authorization and authentication activities that took place on July 2, as per the /var/log/secure log in a CentOS 7 server. This tip may come in handy if you want to inspect a large configuration file. Inserting a blank space every other line and piping the output to less will result in a more-friendly reading experience. The dos2unix program converts plain text files from Windows/Mac formatting to Unix/Linux, removing hidden newline characters inserted by some text editors used in those platforms. If it is not installed in your Linux system, you can mimic its functionality with sed instead of installing it. Please note that the -i option indicate in-place editing. Then changes will not be returned to the screen, but will be saved to the file. Note: You can insert DOS newline characters while editing a file in vim editor with Ctrl+V and Ctrl+M. 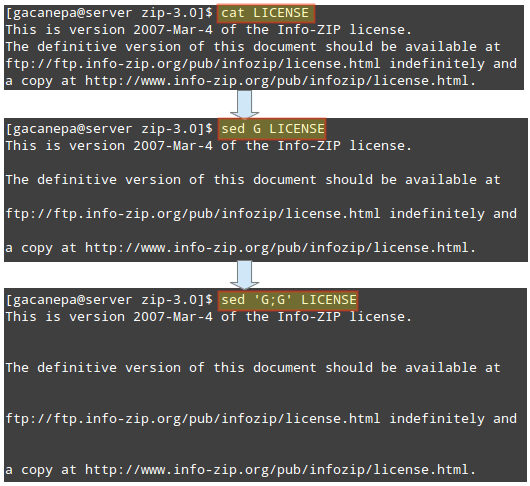 In the previous tip we used sed to modify a file but did not save the original file. Sometimes it’s a good idea to save a backup copy of the original file just in case. 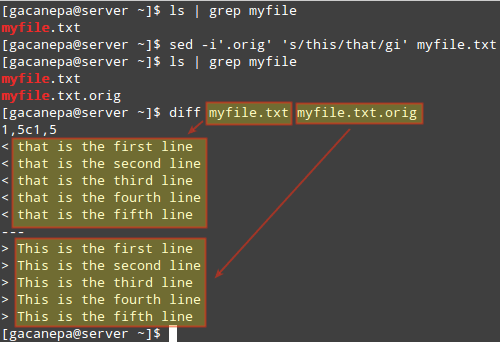 To do that, indicate a suffix following the -i option (inside single quotes) to be used to rename the original file. In the following example we will replace all instances of this or This (ignoring case) with that in myfile.txt, and we will save the original file as myfile.txt.orig. Let’s suppose you have a file containing full names in the format First name, Last name. To adequately process the file, you may want to switch Last name and First name. In the image above we can see that parentheses, being special characters, need to be escaped, as do the numbers 1 and 2. 1 represents the beginning of each line up to the comma. 2 is a placeholder for everything that is right of the comma to the end of the line. The desired output is indicated in the format SecondColumn (Last name) + comma + space + FirstColumn (First name). Feel free to change it to whatever you wish. Sometimes replacing all instances of a given word, or a random few, is not precisely what we need. Perhaps we need to perform the replacement if a separate match is found. but let’s remember to start all services first. In the first line, start will not be replaced with stop since the word services does not appear in that line, as opposed to the second line. You can combine two or more substitutions one single sed command. Let’s replace the words that and line in myfile.txt with This and verse, respectively. Of course, sed can be combined with other tools in order to create more powerful commands. For example, let’s use the example given in TIP #4 and extract our IP address from the output of the ip route command. In this guide we have shared 15 sed tips and tricks to help you with your daily system administration tasks. Is there any other tip that you use on a regular basis and would like to share with us and the rest of the community? If so, feel free to let us know using the comment form below. Questions and comments are also welcome – we look forward to hearing from you! This is very good and useful. I got a question here. Is there a option to roll back to original content once after using sed command to replace any? Even though I have used regex a few times, I keep finding it difficult to create them, thank you for this excellent tips. I am glad that you found these tips useful. Please help us spread the word by sharing this article in your social network profiles! thanks , powerful article .